There are several cost benefits to seal coating asphalt in addition to the ecstatic value of curbside appeal. Application of an emulsion is used as a preventive maintenance function. The purpose is to protect the pavement against damage caused by friction, salt or other abrasives such as oil and gasoline. Sealing also provides a protective barrier against the harmful effects of moisture penetration and UV rays. All will accelerate a breakdown in the asphalt binders. These together are the leading cause of pavement failures. Addressing the failure mechanisms in a timely manner increases the useful life of any asphalt. More importantly keeping your pavements in original performance mode relieves liability. Potholes, skid resistance, polishing, wash boarding is terminology sometimes associated with the legal profession. A no win situation when it comes to you the owner. Whether sealing or micro surfacing it’s time to keep your asset from becoming a liability. Our business has been associated with many first class organizations. 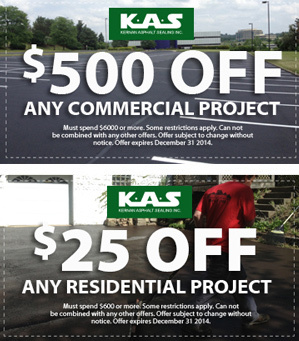 We offer and furnish complete pavement maintenance and reconstruction services. As a general contractor we are able to accommodate. Therefore you don’t have to manage a multitude of contracts to achieve your ultimate goal. One stop shopping in confidence. A short list of activities through affiliations includes MC-70 or MC 30 soil treatments, E-1 Prime dust palliatives, bituminous sealcoat (chip seal). Also replacement of concrete and asphalt surfaces and roadway pavement markings are packaged. Commercial repairs and rehabilitation on existing building components. Let our certified experts evaluate your needs or concerns. They have many years experience to demonstrate the most cost effective approach to your infrastructure problems. We would be happy to provide a cost free estimate for your consideration. The bottom line is the guarantee of workmanship and satisfactory completion as specified. You are one call away and your problems are over.